My little Jack is SEVEN months old and watching him develop and grow is both heartbreaking and exciting. I'm so sad he's getting bigger, but it's so fun to see more of who he is, and see him progress. He was sitting up by himself last month, but now he's totally sturdy and I'm not worried about him toppling over. This has been my favourite thing about this month, because he sits with Piper and they "play together" (aka Piper bosses him around, and he just sits there and grabs stuff). Piper is so good at handing him toys, and surprisingly good at sharing...for now. Jack's a little more interested in Piper, but because she's so little herself, she doesn't quite get how to play with a baby, and is sometimes a bit too aggressive with her affection. He automatically starts flinching a little when she comes over to him haha, but overall they are get along pretty well and Piper LOOOOVES him. I haven't been able to snap a good picture of it yet, but Jack gets the CUTEST crinkle in at the top of his nose when he smiles really big and laughs. It started happening a couple of weeks ago, and I hope it stays forever. It's so sweet. If he is sitting close to something that's at a good height, he'll pull himself up to stand now. When he gets excited while I'm standing him up, his little legs start doing an Irish jig and it's the best haha. I love it. He isn't quite crawling yet (I thought he might be by now), but he army crawls everywhere, and when he's feeling it, gets up on all fours. He hates when I leave a room, and cries if he catches me doing it. When he's sitting up, he raises his arms up to me to hold him. It makes getting anything done super hard, but I kind of love it also. Whenever he's on his tummy, he army crawls his way over to me, and lifts his arms like superman for me to pick him up too haha. He gets so much love everywhere he goes, and his little cousins love him to death. There are usually 2-3 small faces up in his grill at all times when we're with family. He's not really much of a chatter anymore (?? ), which is weird because other mums with 7 month olds are telling me their kids are saying "mama" and "dada" already. And I'm like....yeah...saaame. Not. Although, every single Sunday he seems to squeal, grunt, and yell during church, so I end up in the mothers lounge for all 3 hours. Not sure what that's about. He had FOUR upper teeth pop through this last week (he has six total now), and they've given him/me such a hard time. He had a high temperature for a few days and was SO fussy and sad. He only wanted to stay in my arms, and would cry and cry whenever I set him down. Luckily, he seems to be doing better today, but it was a rough process. 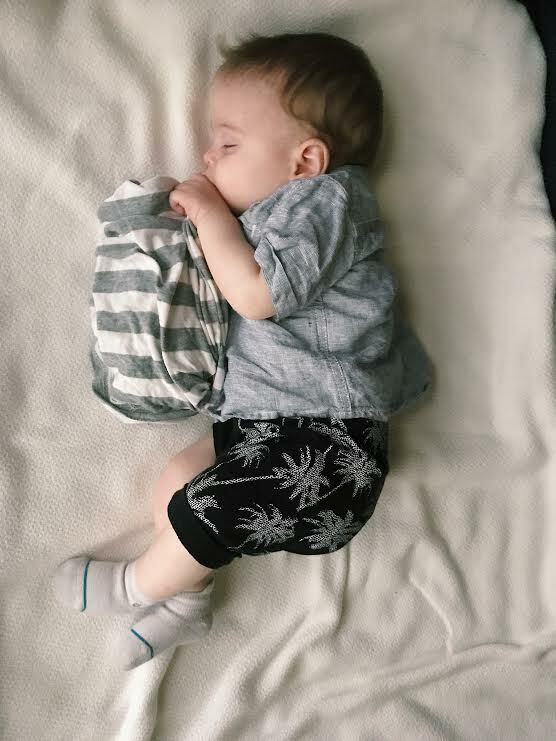 His sleep has been all over the place because of his teeth, but in normally he does really well and sleeps through the night! He 3 naps a day around 9, 12, and 4, and it's SO nice finally having some type of schedule. I'm still breastfeeding and he's loving solids! I just did a post HERE and introducing solids into his diet. This last week he's only wanted to nurse because of his teeth, and has been nursing every 30 minutes (no exaggeration), and I'm probably eating 5,000 calories a day because it leaves me STAR-VING. I'm a ravenous beast. All in all, he's doing great and I feel like we're all in a good groove. Happy seven months Jack! !